One of our most beloved events of the year takes place October 3, 2018, and we cannot wait! If you haven’t attended a Fail Fest before, you’re certainly in for a treat. Fail Fest is a celebration of failure, centered around the idea that we can’t reach our best successes without a few failures along the way. It’s important to remember that not every idea will be a great one and that those we can’t bring to fruition will surely teach us some essential lessons to improve our perspective moving forward, especially in the entrepreneurial community. Our speakers are incredible. 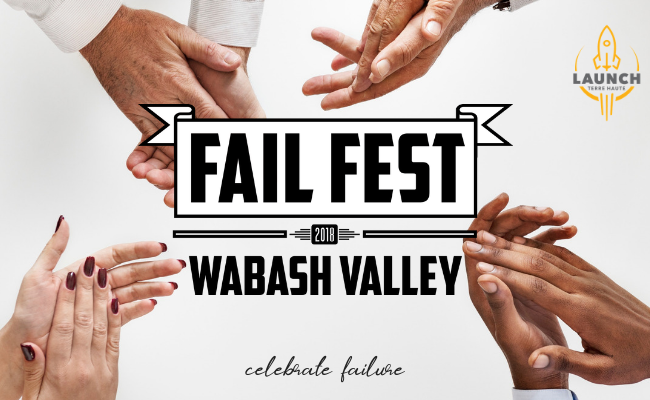 We spend the year before Fail Fest curating a list of diverse and knowledgeable speakers, ready to share their stories of failure with the Wabash Valley. Including folks from different genders, backgrounds, and business endeavors, our speaker lineup provides Fail Fest attendees with a range of topics and discussions to chew on over the course of a day that will leave you inspired and ready to work hard! Brian Vanden Broucke, Are Nine Lives Really Enough? You can learn more about these speakers and see the full schedule here at FailFest.us. Join us to hear local, regional, and national speakers share their personal stories and experiences of how failure played a role in their ultimate success. And remember, as Winston Churchill said, “Success is not final, failure is not fatal: it is the courage to continue that counts.” With this line up of speakers, you’re sure to walk away with insights, motivation and maybe a few tricks to help you pivot and find your greatest success yet.